Conceptions of the American Dream often frame upward mobility as an ideal best accomplished through individual effort and perseverance. However, persistent racial disparities despite similar inputs demand a reconsideration of the story we tell ourselves about the degree to which success is available to everyone. A recent report using data from the Survey of Consumer Finances shows that, in 1983, white households held, on average, 5.3 times greater wealth than black households and 6.1 times greater wealth than Latino households. By 2013, those rates had increased to 7.7 and 6.7 times greater, respectively. This is a growth of 85 percent for white households, but only 27 percent for black households, and 69 percent for Latino households. In order to catch up to white families, black and Latino families would need to find a way to increase their wealth by over 700 percent. But traditional drivers of wealth creation do not produce as much value for people of color relative to their white counterparts (with the exception of Asians). For example, education has long been described as the great equalizer and, while there are significant economic returns to a college degree, there are large earnings and wealth gaps by race even among those who have earned postsecondary degrees. Similarly, homeownership is the largest expenditure for many families and represents a large portion of their total wealth, but non-whites are less likely to own their own home and, when they do, their property values are significantly lower. Given the extent to which homeownership is constrained by income and student loan debt (which is accumulated in larger amounts by non-white students), these racial disparities are not surprising. Source: St. Louis Federal Reserve Bank. The Regional Economist. 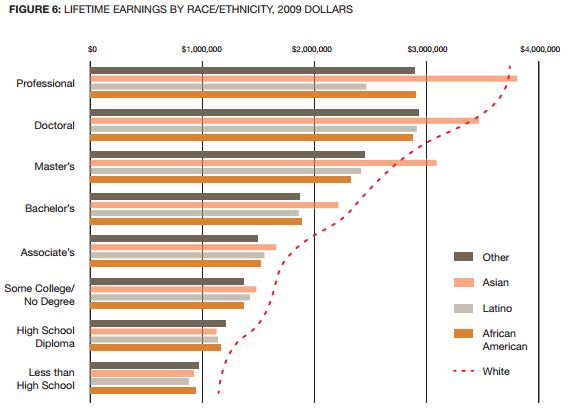 Unequal Degrees of Affluence: Racial and Ethnic Wealth Differences across Education Levels. October 2016. Intergenerational transfers of wealth are another major contributor to wealth creation, but for black families, this strategy is much less successful. 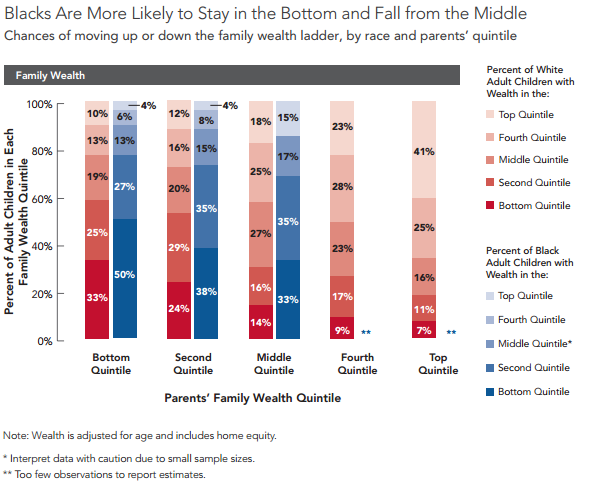 Black children born into moderately wealthy families (the middle wealth quintile), are more than twice as likely as white children to fall from the middle to the bottom quintile as adults (33 percent vs. 14 percent). This trend is especially concerning in the South, with deep racial divides in economic opportunities and a long history of excluding racial minorities from sources of wealth accumulation. For example, the high degree of residential segregation found in the South further exacerbates the gap in wealth created by home ownership; neighborhoods with higher concentrations of non-white residents often have significantly lower property values. Coupled with lower rates of intergenerational income mobility, this suggests that an even greater challenge exists for black and Latino families hoping to build wealth and economic security. If black and Latino families are pursuing the same strategies for upward economic mobility as white families, why aren’t they reaping similar rewards? As we’ve written before, our history, particularly in the South, of economic dependence on forced and exploitative labor limited opportunities for wealth creation for those outside the economic elite, and particularly for people of color. Unequal investment in community resources that are beneficial to the entire population, like schools, transportation, and healthcare compounded these issues. This history and it’s continued legacy, apparent in current disparities, undermines a pillar of our proclaimed American ideal that upward economic mobility is available to all who are motivated, persistent, and hard-working. 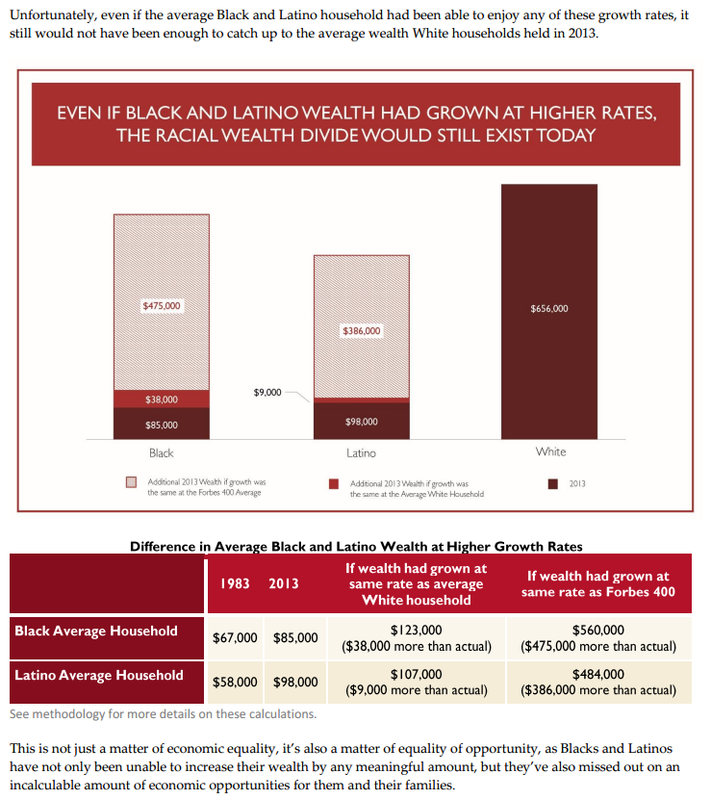 If we believe that closing the racial wealth gap is an issue best solved with strategies implemented at the individual level, what then, is a viable pathway for black and Latino families to catch up, if not through education, income, or homeownership? If we do not have a good answer to this question, we cannot continue to tell ourselves that the only thing standing between poverty and prosperity is a strong work ethic. Instead, we must commit to systemic changes at the institutional level, which focus on the racial disparities among major drivers of wealth creation and create an infrastructure of opportunity that is prosperous for everyone. 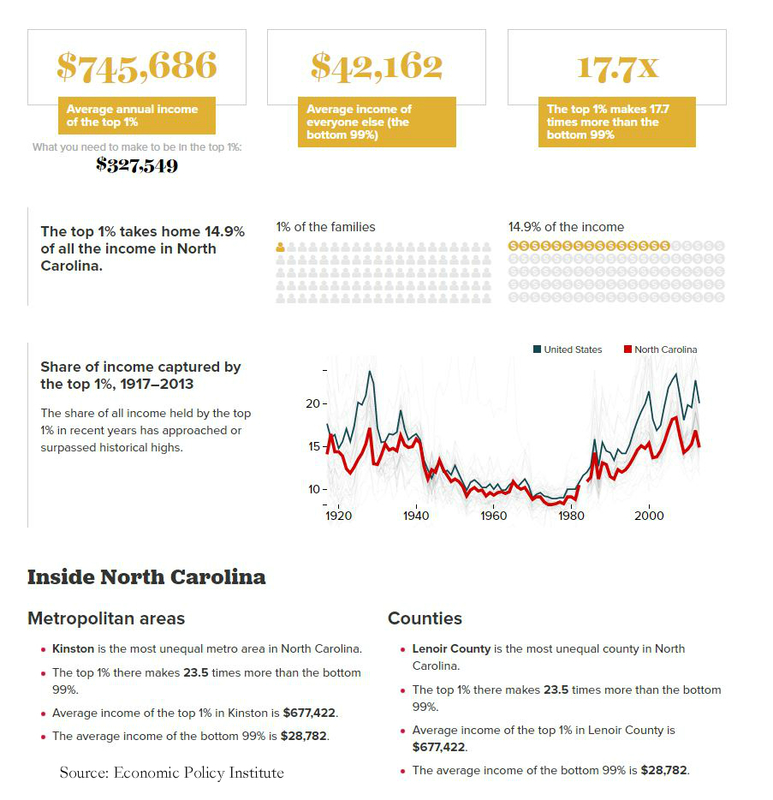 A new report released last month by the Economic Policy Institute displays data on the extensive income inequality across the United States. With the gap between the rich and the poor increasingly widening, traversing what CityLab best describes as an income “chasm” can be exceptionally difficult for those at the bottom of the income distribution. A person’s ability to improve her economic security is inextricably linked to income and as the rungs in the ladder move further and further apart, the more momentum required to make the leap and the higher the risk of never scrambling to the next step. 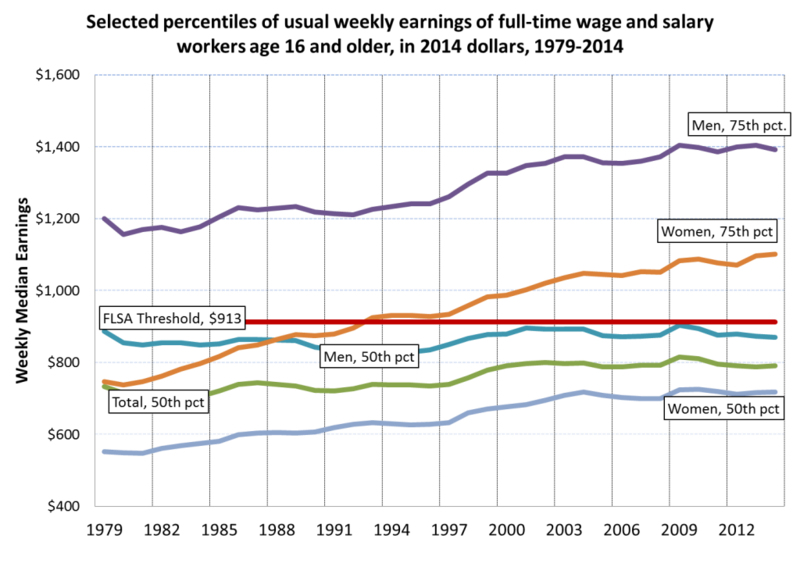 The share of all income controlled by the top 1 percent of the U.S. population has steadily increased for the past thirty years, climbing to 21.1 percent, the highest concentration of wealth controlled by the top 1 percent since before the Great Depression. Since the 1970s, those already at the top have reaped the benefits of productivity gains, while those lower on the distribution didn’t, as worker wages didn’t keep pace with increasing productivity. Because of the difficulty of upward economic movement, those at the top often stay where they are—and so do those on the lower end. Inequality varies across the South and from state to state and continues to be a pressing issue for many Americans. The stickiness at the top and bottom is a national issue, but it’s particularly problematic in the South, even though what you need to make to be considered in the top 1 percent is much lower here than in other parts of the country. In North Carolina, Kentucky, and Mississippi, an income of less than $330,000 would, at minimum, put you in the top 1 percent, while in some New England states like Connecticut and New Jersey, the top 1percent starts at more than $600,000. New York has the highest rate of income inequality, with the top 1 percent making 45.4 times more than the other 99. That 1 percent collects almost a third of New York’s entire income. So while the South’s income inequality might not be as drastic as other areas, it’s harder to move up here than anywhere else—in large part because of policies that have concentrated affluence and poverty in different places, limited investment in public education and infrastructure, and reinforced racial inequity that limits the mobility of a large portion of Southerners. The South is home to centers of economic and cultural growth, but also elevated levels of poverty and socioeconomic stagnation. With the right tools and resources, Southern states can work to alleviate the burden of income inequity and make upward mobility an achievable reality. Financial empowerment efforts to address the racial wealth gap and local programs to build strong connections between education and career advancement are key to creating a region where people can thrive—no matter where they start. In our last blog post on the recently announced changes to the Fair Labor Standards Act (FLSA), we discussed the financial security that a full-time, salaried job with benefits offers to families. Far too many low- and moderate-income Southerners who work full-time, however, do not fully benefit from the increased security of predictable and limited hours. One of the big reasons for this gap is that, until the new changes go into place in December, the intended overtime protections under the FLSA allow some industries to take advantage of outdated regulations, paying poverty-level wages to full-time workers who consistently work above and beyond the 40-hour work week. With the current salary test for exempting an employee from overtime protections ($455 a week in earnings), a single adult with three children is below the poverty line, and well below what it takes to make ends meet. According to an analysis by the Economic Policy Institute, the groups most likely to benefit from the new overtime rules are predominantly women, workers under age 35, racial and ethnic minorities, and those with lower levels of educational attainment. 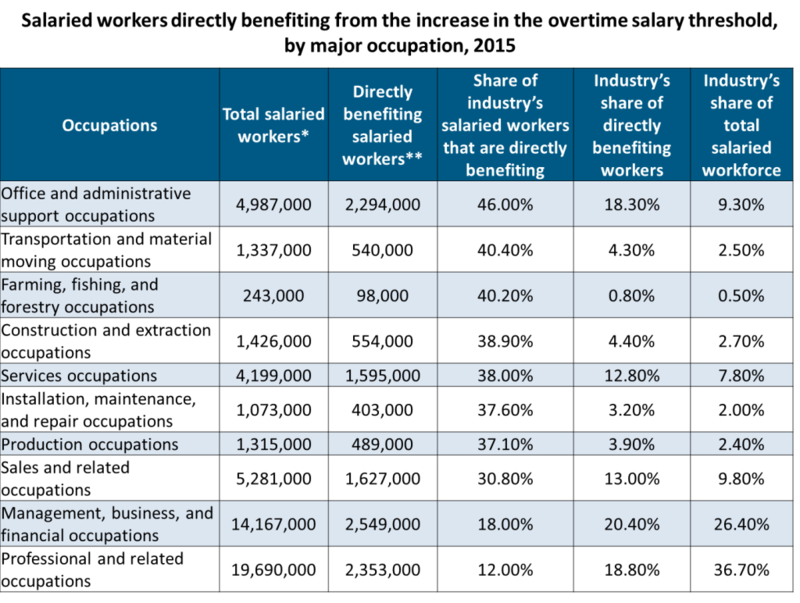 Below, we examine the trends and current earnings gaps by gender, race, educational attainment, and occupations that are most likely to be affected by the new overtime rules. The U.S. Department of Labor issued a final notice of rulemaking that will increase the share and number of workers eligible for overtime protections. Specifically, the ruling increased an outdated salary threshold used to determine eligibility for exemptions from overtime protections: the old threshold of $455 per week (last adjusted in 1975) was updated to a new threshold of $913 per week. The new salary threshold for an overtime-exemption will go into effect on December 1, 2016. In short, a portion of workers that make more than the $455 threshold and less than the $913 threshold will likely get an immediate wage bump. 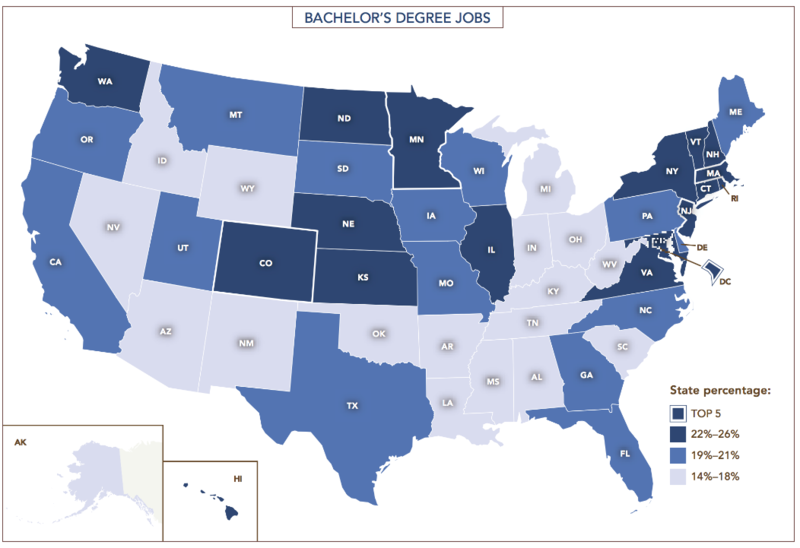 A large percentage of these workers live and work in the South and are likely to benefit from greater financial security and work-life balance that enables the pursuit of additional postsecondary education or training to meet the requirements for the jobs of the future. Who is likely to benefit from these new rules? And how does educational attainment factor in? Women: The gap in median, full-time, salaried weekly earnings for men and women is closing, but the need for progress remains. In 1979, women’s median weekly wages were only 62 percent of their male counterparts; in 2014, that figure was 83 percent. While women now account for a greater proportion of workers in professional occupations, continued growth and representation in occupations that offer a living wage is necessary to close the gender wage gap. Young Adults: Nearly 36 percent of the workforce directly benefiting from the new FLSA rules are in the 16-34 demographic. 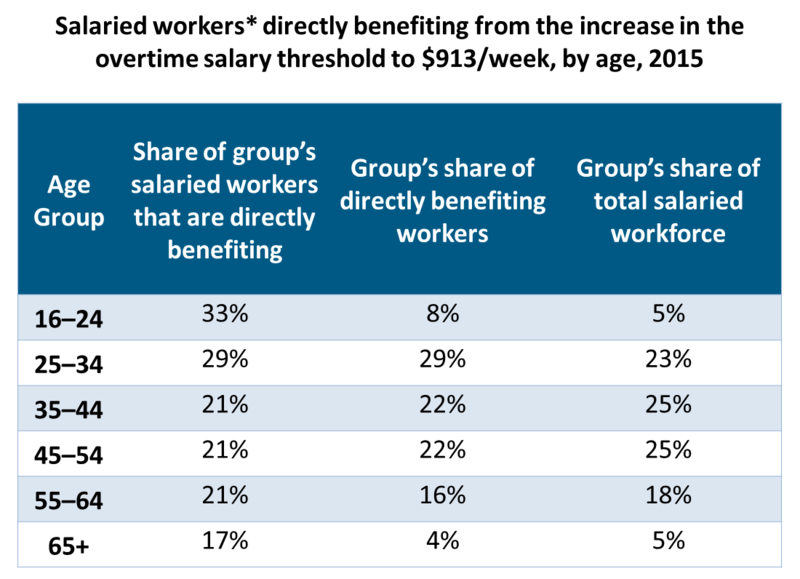 An even higher share of the group’s salaried workforce is projected to benefit than other age groups: 33 percent of 16-24 year olds and 29 percent of the 25-34 years. Adults with less than a college education: A postsecondary degree or credential has long been the strongest predictor of securing a full-time, salaried job in today’s modern economy—but when disaggregated by race and gender, the median weekly earnings for full-time salaried workers are either below or barely above the new threshold for blacks, Hispanics, and women. 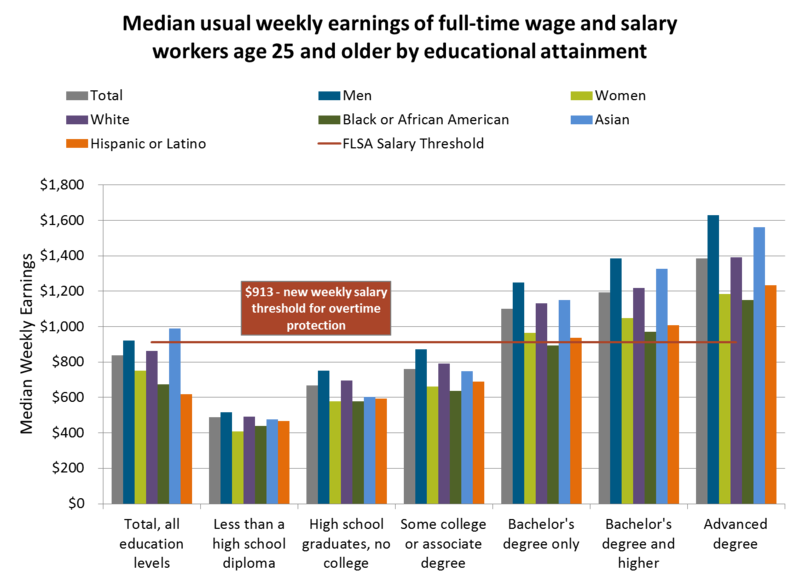 For workers with less than a bachelor’s degree, weekly earnings are well below the new $913 threshold, and for those with less than a high school diploma, right at the 1975 threshold of $455 per week. As shown in the chart below, adults with some college or no college are disproportionately likely to benefit from the changes to the FLSA. 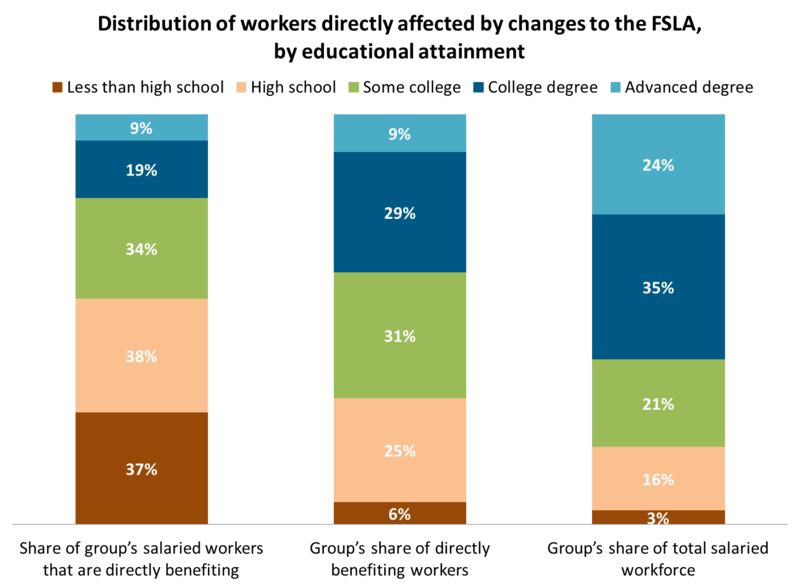 Nearly 62 percent of directly affected workers have some college education or none, and the share of workers by educational attainment is highest among those with at least a high school education (38 percent). Occupations: According to an analysis done by EPI, workers in a set of 13 occupations are most likely to directly benefit from the new changes to the FLSA. Leading the group are two white-collar categories: management, business, and financial occupations; and professional and related occupations. Also on the list is service-sector occupations—a segment of the Southern economy that is growing more rapidly than most. 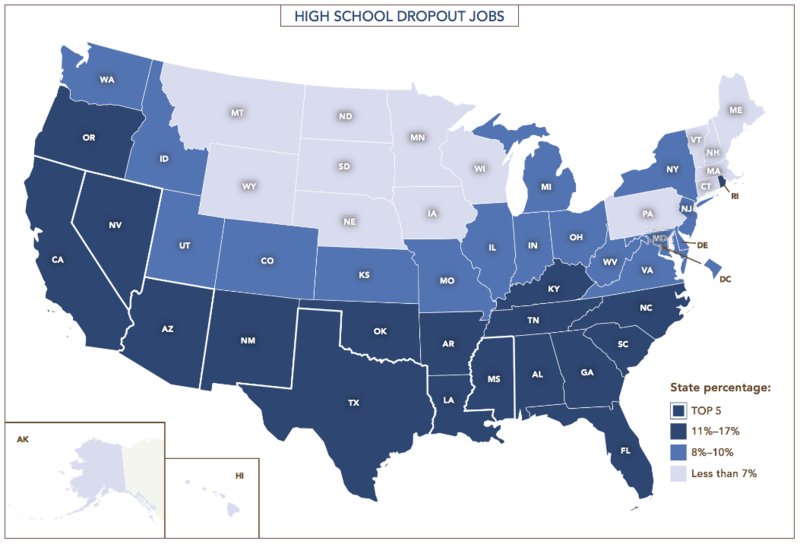 Far too little of the South’s current workforce are earning family-supporting wages—a product of policies, funding, and systems that have continued to produce low educational attainment and employment opportunities in the region. The changes to the FLSA and overtime regulations are expected to largely benefit women, people of color, young adults, and those with lower levels of educational attainment. Changing how work is compensated in the South, however, is not a silver bullet for stalled economic mobility in the region. In order for the South to succeed economically, states and communities must prioritize the building blocks of an Infrastructure of Opportunity for their citizens. As the data above suggest, educational attainment is and always has been the best predictor of a family-supporting wage. For those workers who represent the working-poor, the new FLSA changes offer the potential for an immediate wage boost and the potential for the time and flexibility to pursue a valuable certificate or degree to take the next step in their career. In the Jim Crow South, for the state to require that municipalities protect all residents—in public and private spaces—from race discrimination was regarded by many as an infringement upon the white population’s freedom, but the work of the Civil Rights movement achieved on-the-books protections for race identity. This de-jure protection acknowledges that groups of people experience unique realities given race identity, and that these experiences, while based on constructed categories, result in real non-white disadvantage. Protections based on identity categories are intended to ensure that all people are treated with justice and dignity within our society. Although systemic racism still exists—in our educational , judicial and healthcare systems—we know that explicitly stated policies of nondiscrimination on the basis of race are integral to creating systems and institutions in which people are treated equitably. So if your employer is on record listing your race, national origin, or other protected identity as reason for firing you, that’s unlawful by North Carolina and federal standards. We are not, however, at the point of conferring this same de-jure recognition and protection to the LGBT community. Much of this stems from differing arguments about whether LGBT identities are morally acceptable. Because many legislators and voters do not see these identities as valid, explicit protections for the LGBT community are not prioritized. Inherent in the absence of LGBT individuals as a protected class in both N.C. and many other states’ laws is an underlying argument that LGBT individuals do not experience a disadvantageous distance from opportunity based on these identities—that these individuals’ experiences of being non-cisgender and/or non-heterosexual do not create real disadvantage. Here are a few snapshots of data that shine light on the current challenges that LGBT individuals face in attaining the types of mobility we talk about here on the State of the South blog. According to a recent Williams Institute at the University of California study, 35 percent of LGBT adults live in the South—more than any other region in the U.S. This data overview is, indeed, just an overview. It should be noted that transgender individuals, just like all individuals, experience varying degrees of challenges and discrimination based on overlapping identities. For example, African-American transgender individuals are significantly more likely to experience employment discrimination and housing segregation. We’re always trying to refine our perspective to take in the full picture of what’s going on in the Southern landscape of equitable opportunity for upward social and economic mobility. We describe equitable mobility using three measures of well-being: thriving, belonging, and contributing. Upward mobility will be more likely when residents can, for example, find belonging in safe, affordable housing, thrive in equitable educational settings, and contribute to society in good health. If we only measure the well-being of people that our laws consider members of protected classes, we resign ourselves to the current state and operation of our systems and policies, making it easy to miss those on the margins—those for whom opportunity is particularly far off. Housing, education, and health, along with equal opportunity for employment and economic security, are necessary for an infrastructure of opportunity in which all young people and adults have an equitable opportunity to achieve upward social and economic mobility. But when a specific demographic of people in the U.S., many of whom reside in the South, are regularly and systemically barred from these building blocks to opportunity, the overall integrity and wellbeing of our society and economy suffers, and we betray our proud American belief in equal opportunity for all. These systemic barriers are not inevitable, but rather are created; therefore our systems’ outcomes are also not inevitable, but rather can be improved by building an infrastructure of opportunity complete with affirming and supportive pathways and policies.